I wish you all a joyous Easter, and new depth in your walk as you reflect on the ultimate offering of love. I have had occasion to thank God for His goodness too, over this past couple of months, a friend and colleague has committed her life to Christ, despite many years of resistance and a Buddhist family background. Her example is a refreshing reminder to me of Gods longing for a real relationship with us all. 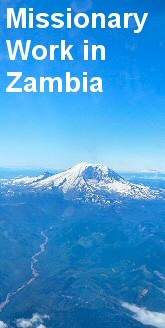 Zambians are very good at relationship, in the sense that they have a strong community identity. It was confusing at first to hear of someone referring to several different people as his mother, until I cottoned on that relationship automatically means family in Zambia. Everyone is potentially my brother or my mother or my child. As a Zambian I will think nothing of taking in children of distant relatives and look after them as my own, unselfishly sharing the little I have with them. I marvel at their generosity in the sight of such poverty. This is something that is becoming rarer in western society as we live our insular lives in our increasingly nuclear and often disjointed families. I am reminded that ours is a God of the poor: he values the widows mite above the rich mans wallet, and chooses to sit with the outcasts rather than the influential. I recently had one of those wry little incidents that make you smile at Gods humour. Usually I ask for a smooth passage through the events of the day, but this Monday my prayers seemed to have had little effect. The first clue that things were going awry was when my transport to Ipusukilo left without me. I turned round to pick up my bags and there it was trundling off in the distance! An hour later, the bus returned and I was assured they would take me straight to my group, - only to have the bus break down on the way there! The marvellous women in the positive living group stayed with me all afternoon at our meeting place outside the MTN building. I was grateful, as I would have felt nervous waiting all on my own in this destitute compound. Time passed as we chatted and they sewed, watching life go by, shouting warm greetings to people travelling on the dusty road. I watched a car pull up and saw a man buy toasted sweet corn for his wife from an impromptu stall set up a few moments before by some youngsters (everyone hustles for a few kwacha here). The driver was slowly making his way along the rutted dirt road, and as he neared us he stopped, & got out. He came over and greeted everyone. I heard Agnes tell him about the group: they were all widows, all HIV positive, they had dependent children, and they had used a micro loan to try and generate an income through making mats, sewing and crochet. Who was the Musungu sat amongst them? Oh yes, she is a friend who comes to see us often; she always brings something to eat and clean water. I didn't catch the next bit so well, but could tell by the look on Agnes' face it was good news. It was explained that I was stranded and the man offered to take me back to Mindolo. On the way back in the car he said he was a local businessman who had been looking for a good cause to donate to! His curiosity had been aroused when he saw me amongst this group of busy chattering women and after talking with them he was thinking of supporting them in some way. After all, if I could come from so far away to help them that was the least a Zambian could do! I smiled thanking God for life's ironies. A satisfactory resolve to a serious dispute between the management and workers at Mindolo. That the participants will not loose their focus on their studies during this uncertain time. Continued wisdom and insight to know how to best help the people I meet who are in great need. My thanks go out to you also for my continued good health, so far, I have managed to avoid malaria; I am sure your prayers have helped. And also to God, for the containment of the Cholera outbreak which could have so devastated Ipusukilo.